About Lions Club - TUBE SAN MARCOS! ​to find out how to become a member, please visit the club website at ​​SanMarcosLionsClub.org. The Tube Rental and River Shuttle are fund raising projects of the San Marcos Lions Club. The Tube Rental is located in City Park. Proceeds from this and other projects allow the Lions Clubs to support many charities and educational opportunities for students. The San Marcos Lions Club tube rental originally began during the 1970’s out of a cattle truck with a portable air compressor and recycled automotive tubes. They would show up about 10 on the weekends and rent tubes out of a truck behind Joe’s Crab Shack. When the day was over, the tubes were stored in a member’s garage. What started out as 20-40 tube rentals a day has grown to 800-850 rentals a day, making this program the single largest fundraising event by the San Marcos Area Lions Club. Today, we have a building in City Park and each year students from Bobcat Build and other volunteers work with Lions to get the Tube Rental ready for business! Now, the tube rental allows the Lions Club to donate to over 100 charities and individuals in our area. Who Benefits from the money raised by the tube rental? 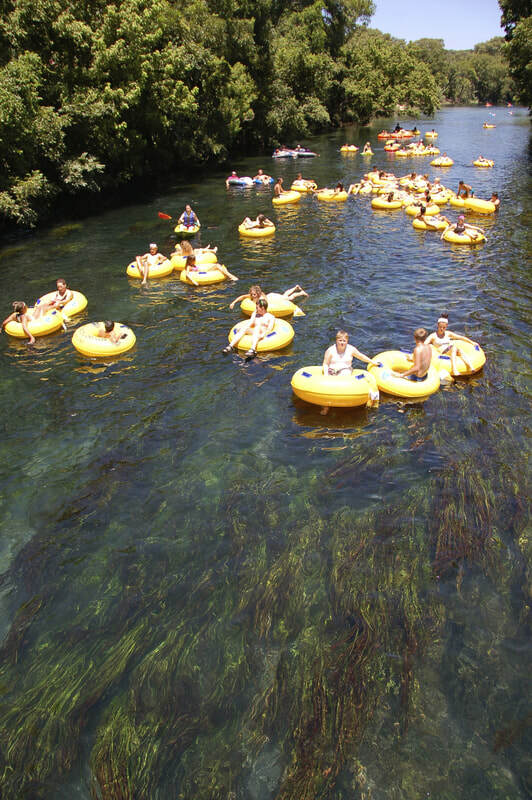 When you come and tube the river at the local San Marcos Lions Club Tube Rental, all of the profits go directly to benefit these charities as well as other National Lion Programs! We serve over 100 Charities and individuals in our local community and we gladly serve our community! Want a cool job this summer? Lions Club Tube Rental is looking for temporary employees for the concession and tube rental area. Shuttle drivers are also needed and a CDL license is required for that position. We are also hiring tube trailer drivers, no CDL required. Must be age 21 or older. Click on this application link, fill out the form, and click submit. That's all there is to it! If you are a non-profit organization in the San Marcos, Texas area and would like to apply for a San Marcos Lions Club grant, please contact ​Cody Dailey. For a list of area attractions, restaurants, shopping and accommodations, visit www.toursanmarcos.com. Learn more about the ​endangered species in our river and the Edwards Underground Aquifer. Check the springs flow rate of the San Marcos River.